For a carefully considered purchase like a vehicle, the internet is a dream come true. All of the information that a shopper could want is out there: prices, reviews, dealer ratings, negotiating tips, and more. A recent CarGurus/GfK survey reported that on average, today’s auto shoppers interact with more than 18 auto industry sites—from OEMs to general industry publications and third-party marketplaces to dealers’ own sites. That high number is because shoppers tend to get the info they want through searches, instead of starting with a specific resource. These kinds of searches are incredibly attractive to marketers, as they demonstrate serious intent to buy a vehicle. 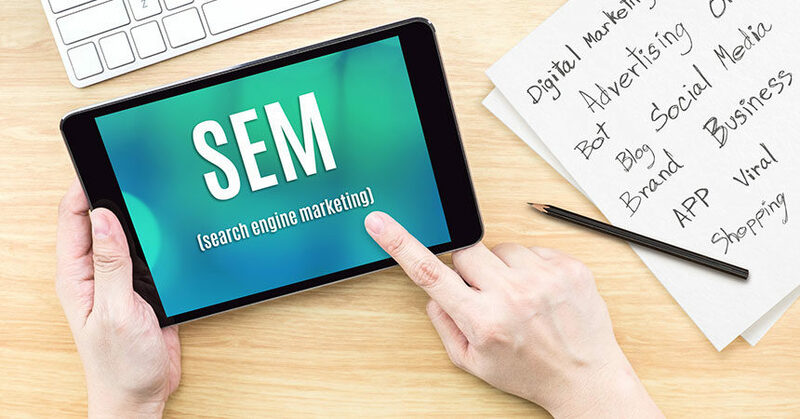 As a result, search engine marketing (SEM) spend has skyrocketed: U.S. search ad spend totaled $4.8 billion in 2017, according to eMarketer, accounting for about 45% of all digital ad spend in automotive. This increase brings with it a challenge: competition. Not only are dealers competing with other dealerships in their area to attract the same shoppers, they’re also competing with deep-pocketed OEMs and third-party marketplaces that operate at national scale. Efficient SEM performance requires data and technology that many dealers don’t have access to on their own. It’s not hopeless for them, though. With the right data, technology, and focus, SEM can be an efficient, large-scale contributor to your bottom line. Here are the four common mistakes that can drag down results, and how to combat them. Small-scale SEM campaigns are unlikely to perform for car dealers. This doesn’t mean that you need to spend a ton of money, however: The scale that matters here is keyword volume. You’ve probably heard of the “long tail.” While a few hundred keywords (the “head”) get many thousands of searches per month, most searches are in the long tail—over 70%, according to SEOMoz. Although the shorter head term gets many more searches, it’s hard to tell exactly what those searchers want. A new truck, or used? Maybe they need service, tires, or floor mats. In contrast, the long-tail search is a very clear indicator of someone in the market to buy a truck. The catch: To get those low-cost, high-quality clicks, you need to have a lot of keywords in your campaigns. Tens of thousands is not uncommon, and programmatic campaigns can easily reach hundreds of thousands or even millions of keywords. 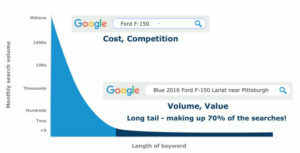 Long-tail bidding is about more than just volume—it’s also about value. The longer and more specific search terms get, the more valuable they are. In order to spend efficiently, you need to choose specific bids for each keyword based on what that shopper is worth. A truly programmatic bidding system strives to place bids on each and every keyword uniquely, based on all available data. This takes a lot of data and a robust platform, but modern SEM technology is built to handle it. The right landing pages can have a dramatic impact on SEM results. This starts with matching the landing page as closely as possible to the original search. If a user searches for a 2013 Honda Civic, for example, you shouldn’t take them to your home page, new car specials, or even overall used car listings—you should direct them to a page that shows Civics . . . either a filtered search results page or a vehicle detail page. This direct match between search and result will improve conversion rates—and better conversion rates improve Google’s rating of your dealership’s site. This is improves your quality score, which in turn improves your chances of winning subsequent ad auctions. Changing inventory: If your campaign is targeting specific make and model keywords, as it should, it needs to be updated to reflect the vehicles actually on your lot. No SEM campaign, big or small, hits it out of the park on the first try. Fortunately, large-scale campaigns with individually set bids generate a ton of data on what’s working and what’s not. Dealers need to use that data to optimize bids and keyword targets over time. Whether you’re assembling an in-house team or using an outside vendor to manage your SEM, if your dealership avoids these four critical mistakes, SEM can be a central component of your marketing. It’s not easy: Running a large-scale SEM campaign as described here requires a significant amount of data, technology, and expertise. But dealers who put the time and effort in will see positive returns. Andrew Grochal leads CarGurus’ product strategy and development for the company’s dealership base, including enhancements to existing tools and launching the next generation of products. Prior to CarGurus, Andrew gained an in-depth knowledge of software and technology at Bain & Company, and also thrived in start-up companies such as Warby Parker and DraftDay. He holds an MBA from Harvard Business School and a BA from Duke University.